If you haven’t heard the news yet, the LEGO Monthly Mini Builds will have some changes starting in July. Registration opens on June 1 at 9am EST and will be open until July 6th at 11:59pm EST. You will now have to reserve your spot before you head out to the store. If you don’t register, you won’t be able to get one and there are no rainchecks. There are about 120 Mini Builds per store, per night and registration is on a first come, first serve basis. Another change is that you can not just pick up the set and leave. Kids are now required to participate in the event so plan on staying a while if you sign up. 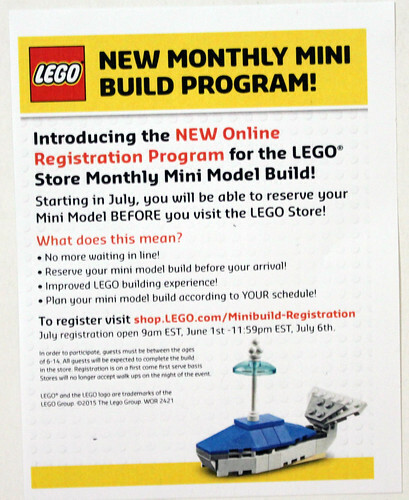 Starting in July, you will be able to reserve your Mini Model Before you visit the LEGO Store! Reserve your mini model build before your arrival! Plan your mini model build according to YOUR schedule! To register visit http://shop.lego.com/en-US/minibuild-registration July registration open 9am EST, June 1st – 11:59pm EST, July 6th. Previous articleLEGO Trickster Minifigure Confirmed for LEGO DC Super Heroes Justice League: Attack of the Legion of Doom!